Ackroyd CE, Polyzoides AJ. Patellectomy for osteoarthritis. A study of eighty-one patients followed from two to twenty-two years. J Bone Joint Surg Br. Aug 1978;60-B(3):353-7. Adachi N, Deie M, Nakamae A, Ishikawa M, Motoyama M, Ochi M. Functional and radiographic outcome of stable juvenile osteochondritis dissecans of the knee treated with retroarticular drilling without bone grafting. Arthroscopy. Feb 2009;25(2):145-52. Adachi N, Ochi M, Uchio Y, Kuriwaka M, Shinomiya R. Torn discoid lateral meniscus treated using partial central meniscectomy and suture of the peripheral tear. Arthroscopy. May 2004;20(5):536-42. Ahn JH, Nha KW, Kim YC, Lim HC, Nam HW, Wang JH. Arthroscopic femoral tensioning and posterior cruciate ligament reconstruction in chronic posterior cruciate ligament injury. Arthroscopy. Mar 2006;22(3):341.e1-4. Ahn JH, Yoo JC, Wang JH. Posterior cruciate ligament reconstruction: double-loop hamstring tendon autograft versus Achilles tendon allograft–clinical results of a minimum 2-year follow-up. Arthroscopy. Aug 2005;21(8):965-9. 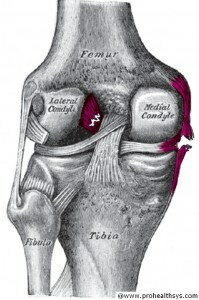 Amis AA, Gupte CM, Bull AM, Edwards A. Anatomy of the posterior cruciate ligament and the meniscofemoral ligaments. Knee Surg Sports Traumatol Arthrosc. Mar 2006;14(3):257-63. Argenson JN, Guillaume JM, Aubaniac JM. Is there a place for patellofemoral arthroplasty?. Clin Orthop Relat Res. Dec 1995;162-7. Arnoczky SP, Warren RF. Microvasculature of the human meniscus. Am J Sports Med. Mar-Apr 1982;10(2):90-5. Arnoczky SP, Warren RF. The microvasculature of the meniscus and its response to injury. An experimental study in the dog. Am J Sports Med. May-Jun 1983;11(3):131-41. Baker CL Jr, Norwood LA, Hughston JC. Acute combined posterior cruciate and posterolateral instability of the knee. Am J Sports Med. May-Jun 1984;12(3):204-8. Barclay L, Nghiem HT. Arthroscopic Surgery May Not Be Helpful for Knee Osteoarthritis. Medscape. Available at http://www.medscape.com/viewarticle/580300. Accessed September 11, 2008. Behairy NH, Dorgham MA, Khaled SA. Accuracy of routine magnetic resonance imaging in meniscal and ligamentous injuries of the knee: comparison with arthroscopy. Int Orthop. May 28 2008;epub ahead of print. Belanger MJ, Moore DC, Crisco JJ 3rd, Fadale PD, Hulstyn MJ, Ehrlich MG. Knee laxity does not vary with the menstrual cycle, before or after exercise. Am J Sports Med. Jul-Aug 2004;32(5):1150-7. Bentley G, Biant LC, Carrington RW, Akmal M, Goldberg A, Williams AM, et al. A prospective, randomised comparison of autologous chondrocyte implantation versus mosaicplasty for osteochondral defects in the knee. J Bone Joint Surg Br. Mar 2003;85(2):223-30. Bergfeld JA, McAllister DR, Parker RD, et al. The effects of tibial rotation on posterior translation in knees in which the posterior cruciate ligament has been cut. J Bone Joint Surg Am. Sep 2001;83-A(9):1339-43. Beynnon BD, Johnson RJ, Abate JA, Fleming BC, Nichols CE. Treatment of anterior cruciate ligament injuries, part I. Am J Sports Med. Oct 2005;33(10):1579-602. Boyd AD Jr, Ewald FC, Thomas WH, Poss R, Sledge CB. Long-term complications after total knee arthroplasty with or without resurfacing of the patella. J Bone Joint Surg Am. May 1993;75(5):674-81. Brittberg M, Lindahl A, Nilsson A, Ohlsson C, Isaksson O, Peterson L. Treatment of deep cartilage defects in the knee with autologous chondrocyte transplantation. N Engl J Med. Oct 6 1994;331(14):889-95. Brophy RH, Gill CS, Lyman S, Barnes RP, Rodeo SA, Warren RF. Effect of anterior cruciate ligament reconstruction and meniscectomy on length of career in National Football League athletes: a case control study. Am J Sports Med. Nov 2009;37(11):2102-7. Brophy RH, Wright RW, David TS, McCormack RG, Sekiya JK, Svoboda SJ, et al. Association Between Previous Meniscal Surgery and the Incidence of Chondral Lesions at Revision Anterior Cruciate Ligament Reconstruction. Am J Sports Med. Apr 2012;40(4):808-814. Cain TE, Schwab GH. Performance of an athlete with straight posterior knee instability. Am J Sports Med. Jul-Aug 1981;9(4):203-8. Camathias C, Festring JD, Gaston MS. Bioabsorbable lag screw fixation of knee osteochondritis dissecans in the skeletally immature. J Pediatr Orthop B. Mar 2011;20(2):74-80. Chhadia AM, Inacio MC, Maletis GB, Csintalan RP, Davis BR, Funahashi TT. Are meniscus and cartilage injuries related to time to anterior cruciate ligament reconstruction?. Am J Sports Med. Sep 2011;39(9):1894-9. Choi NH, Kim TH, Victoroff BN. Comparison of arthroscopic medial meniscal suture repair techniques: inside-out versus all-inside repair. Am J Sports Med. Nov 2009;37(11):2144-50. Chu CR, Convery FR, Akeson WH, Meyers M, Amiel D. Articular cartilage transplantation. Clinical results in the knee. Clin Orthop Relat Res. Mar 1999;159-68. Clancy WG Jr, Shelbourne KD, Zoellner GB, et al. Treatment of knee joint instability secondary to rupture of the posterior cruciate ligament. Report of a new procedure. J Bone Joint Surg Am. Mar 1983;65(3):310-22. Cosgarea AJ, Sebastianelli WJ, DeHaven KE. Prevention of arthrofibrosis after anterior cruciate ligament reconstruction using the central third patellar tendon autograft. Am J Sports Med. Jan-Feb 1995;23(1):87-92. Cross MJ, Powell JF. Long-term followup of posterior cruciate ligament rupture: a study of 116 cases. Am J Sports Med. Jul-Aug 1984;12(4):292-7. Crossley KM, Marino GP, Macilquham MD, Schache AG, Hinman RS. Can patellar tape reduce the patellar malalignment and pain associated with patellofemoral osteoarthritis?. Arthritis Rheum. Dec 15 2009;61(12):1719-25. Daniel DM, Malcom LL, Losse G, Stone ML, Sachs R, Burks R. Instrumented measurement of anterior laxity of the knee. J Bone Joint Surg Am. Jun 1985;67(5):720-6. Daniel DM, Stone ML, Barnett P, Sachs R. Use of the quadriceps active test to diagnose posterior cruciate-ligament disruption and measure posterior laxity of the knee. J Bone Joint Surg Am. Mar 1988;70(3):386-91. Delee JC. Orthopaedic Sports Medicine, Principles and Practice. Vol 2. Philadelphia, Pa: WB Saunders Co; 1994. Ding J, Zhao J, He Y, Huangfu X, Zeng B. Risk factors for articular cartilage lesions in symptomatic discoid lateral meniscus. Arthroscopy. Dec 2009;25(12):1423-6. Donovan. Posterior cruciate ligament injury on artificial turf. Orthop. 1977;1:20. Duquin TR, Wind WM, Fineberg MS, Smolinski RJ, Buyea CM. Current trends in anterior cruciate ligament reconstruction. J Knee Surg. Jan 2009;22(1):7-12. Eren OT. The accuracy of joint line tenderness by physical examination in the diagnosis of meniscal tears. Arthroscopy. Oct 2003;19(8):850-4. Erickson BJ, Chalmers PN, Yanke AB, Cole BJ. Surgical management of osteochondritis dissecans of the knee. Curr Rev Musculoskelet Med. Jun 2013;6(2):102-14. Fairbanks TJ. Knee joint changes after meniscectomy. J Bone Joint Surg Br. 1948;30:664-70. Feller JA, Bartlett RJ. Patellectomy and osteoarthritis: arthroscopic findings following previous patellectomy. Knee Surg Sports Traumatol Arthrosc. 1993;1(3-4):159-61. Fitzpatrick PL, Morgan DA. Fresh osteochondral allografts: a 6-10-year review. Aust N Z J Surg. Aug 1998;68(8):573-9. Fowler PJ, Messieh SS. Isolated posterior cruciate ligament injuries in athletes. Am J Sports Med. Nov-Dec 1987;15(6):553-7. Freedman KB, Nho SJ, Cole BJ. Marrow stimulating technique to augment meniscus repair. Arthroscopy. Sep 2003;19(7):794-8. Froimson MI, Ratcliffe A, Gardner TR, Mow VC. Differences in patellofemoral joint cartilage material properties and their significance to the etiology of cartilage surface fibrillation. 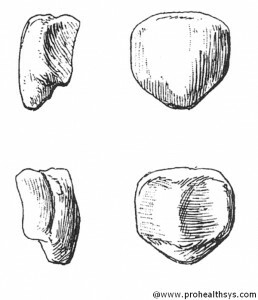 Osteoarthritis Cartilage. Nov 1997;5(6):377-86. 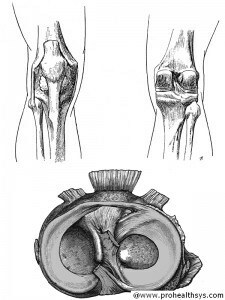 Gardner E, O’Rahilly R. The early development of the knee joint in staged human embryos. J Anat. Jan 1968;102(2):289-99. Garr EL, Moskowitz RW, Davis W. Degenerative changes following experimental patellectomy in the rabbit. Clin Orthop Relat Res. May 1973;296-304. Geib TM, Shelton WR, Phelps RA, Clark L. Anterior cruciate ligament reconstruction using quadriceps tendon autograft: intermediate-term outcome. Arthroscopy. Dec 2009;25(12):1408-14. Getelman MH, Friedman MJ. Revision anterior cruciate ligament reconstruction surgery. J Am Acad Orthop Surg. May-Jun 1999;7(3):189-98. Ghazavi MT, Pritzker KP, Davis AM, Gross AE. Fresh osteochondral allografts for post-traumatic osteochondral defects of the knee. J Bone Joint Surg Br. Nov 1997;79(6):1008-13. Goodfellow J, Hungerford DS, Zindel M. Patello-femoral joint mechanics and pathology. 1. Functional anatomy of the patello-femoral joint. J Bone Joint Surg Br. Aug 1976;58(3):287-90. Grande DA, Singh IJ, Pugh J. Healing of experimentally produced lesions in articular cartilage following chondrocyte transplantation. Anat Rec. Jun 1987;218(2):142-8. Grelsamer RP, Weinstein CH. Applied biomechanics of the patella. Clin Orthop Relat Res. Aug 2001;9-14. Hangody L, Füles P. Autologous osteochondral mosaicplasty for the treatment of full-thickness defects of weight-bearing joints: ten years of experimental and clinical experience. J Bone Joint Surg Am. 2003;85-A Suppl 2:25-32. Hart ES, Kalra KP, Grottkau BE, Albright M, Shannon EG. Discoid lateral meniscus in children. Orthop Nurs. May/June 2008;27(3):174-9. Herberhold C, Faber S, Stammberger T, Steinlechner M, Putz R, Englmeier KH, et al. In situ measurement of articular cartilage deformation in intact femoropatellar joints under static loading. J Biomech. Dec 1999;32(12):1287-95. Herberhold C, Stammberger T, Faber S, Putz R, Englmeier KH, Reiser M, et al. An MR-based technique for quantifying the deformation of articular cartilage during mechanical loading in an intact cadaver joint. Magn Reson Med. May 1998;39(5):843-50. Hermans S, Corten K, Bellemans J. Long-term results of isolated anterolateral bundle reconstructions of the posterior cruciate ligament: a 6- to 12-year follow-up study. Am J Sports Med. Aug 2009;37(8):1499-507. Herzog W, Diet S, Suter E, Mayzus P, Leonard TR, Müller C, et al. Material and functional properties of articular cartilage and patellofemoral contact mechanics in an experimental model of osteoarthritis. J Biomech. Dec 1998;31(12):1137-45. Hewson GF Jr, Mendini RA, Wang JB. Prophylactic knee bracing in college football. Am J Sports Med. Jul-Aug 1986;14(4):262-6. Heywood CS, Benke MT, Brindle K, Fine KM. Correlation of magnetic resonance imaging to arthroscopic findings of stability in juvenile osteochondritis dissecans. Arthroscopy. Feb 2011;27(2):194-9. Huberti HH, Hayes WC. Patellofemoral contact pressures. The influence of q-angle and tendofemoral contact. J Bone Joint Surg Am. Jun 1984;66(5):715-24. Ikejiani CE, Leighton R, Petrie DP. Comparison of patellar resurfacing versus nonresurfacing in total knee arthroplasty. Can J Surg. Feb 2000;43(1):35-8. Iwamoto J, Takeda T, Sato Y, Matsumoto H. Retrospective case evaluation of gender differences in sports injuries in a Japanese sports medicine clinic. Gend Med. Dec 2008;5(4):405-14. Janousek AT, Jones DG, Clatworthy M, et al. Posterior cruciate ligament injuries of the knee joint. Sports Med. Dec 1999;28(6):429-41. Järvelä T, Paakkala T, Kannus P, Järvinen M. The incidence of patellofemoral osteoarthritis and associated findings 7 years after anterior cruciate ligament reconstruction with a bone-patellar tendon-bone autograft. Am J Sports Med. Jan-Feb 2001;29(1):18-24. Jerosch J, Riemer S. [How good are clinical investigative procedures for diagnosing meniscus lesions?] [German]. Sportverletz Sportschaden. Jun 2004;18(2):59-67. Johnson DL, Harner CD, Maday MG. Revision anterior cruciate ligament surgery. Knee Surg. 1994;1:877-95. Johnson LL, van Dyk GE, Green JR 3rd, Pittsley AW, Bays B, Gully SM, et al. Clinical assessment of asymptomatic knees: comparison of men and women. Arthroscopy. May-Jun 1998;14(4):347-59. Joshi AB, Lee CM, Markovic L, Murphy JC, Hardinge K. Total knee arthroplasty after patellectomy. J Bone Joint Surg Br. Nov 1994;76(6):926-9. Jung TM, Höher J, Weiler A. Screw fixation of a 4 1/2-year-old PCL avulsion injury. Knee Surg Sports Traumatol Arthrosc. May 2006;14(5):469-72. Jung YB, Jung HJ, Tae SK, Lee YS, Yang DL. Tensioning of remnant posterior cruciate ligament and reconstruction of anterolateral bundle in chronic posterior cruciate ligament injury. Arthroscopy. Mar 2006;22(3):329-38. Kawakubo M, Matsumoto H, Otani T, Fujikawa K. Radiographic changes in the patella after total knee arthroplasty without resurfacing the patella. Comparison of osteoarthrosis and rheumatoid arthritis. Bull Hosp Jt Dis. 1997;56(4):237-44. Kelly JD 4th, Ebrahimpour P. Chondral injury and synovitis after arthroscopic meniscal repair using an outside-in mulberry knot suture technique. Arthroscopy. May 2004;20(5):e49-52. Kelly MA, Insall JN. Historical perspectives of chondromalacia patellae. Orthop Clin North Am. Oct 1992;23(4):517-21. Kijowski R, Blankenbaker DG, Shinki K, Fine JP, Graf BK, De Smet AA. Juvenile versus adult osteochondritis dissecans of the knee: appropriate MR imaging criteria for instability. Radiology. Aug 2008;248(2):571-8. Kim BS, Reitman RD, Schai PA, Scott RD. Selective patellar nonresurfacing in total knee arthroplasty. 10 year results. Clin Orthop Relat Res. Oct 1999;81-8. Kim SB, Ha JK, Lee SW, Kim DW, Shim JC, Kim JG, et al. Medial meniscus root tear refixation: comparison of clinical, radiologic, and arthroscopic findings with medial meniscectomy. Arthroscopy. Mar 2011;27(3):346-54.